It all started quite innocently. At mid-day, on an unseasonably hot day in early October with a howling westerly wind, I put on my flipflops (unheard of in October in the high midlands of Tasmania), and went down to let the dogs out of their kennels for a run around the big yard. Wearing my indoor hot weather trousers and a lightweight wool “skivvy”, I had no pocket for the phone I take everywhere with me on the farm, in case of an accident. Bulbine lillies (bulbine glauca)–a favourite tidbit of my sheep. These are growing just inside a reserve fence. Partway to the kennels, I remembered I wanted to check to be sure I’d mustered all of the sheep out of the Long Paddock, the laneway from the lower part of the farm to the back. Later in the afternoon I’d be running my pack of dogs up there, and I really didn’t want to find a single, or even a few, sheep at the gate. The ensuing chaos of excited dogs and sheep in flight is so not fun. More dogs than sheep is a recipe for disaster. Blushing bindweed (convolvulus erubescens). I love the splash of colour across the otherwise sere hillside. So, before letting the dogs go, I hopped Janie, Chance and me into the electric Polaris “buggy” and chuffed up the hill to the gate at the top of the Long Paddock. No sheep. Good. Then I remembered I hadn’t checked the fences around the Forest—the revegetation area bordering the highway—since taking the sheep out of there two days ago. Some time ago, I found a sheep I’d missed weeks before, with her head caught in the fence. Her death hit me pretty hard, both because I’d missed seeing her, and because she was the only “death by misadventure” all of last year. Common everlasting (chrysocephalum apiculatum) and smooth riceflower (pimelea glauca). From the top of the Long Paddock, I had a good view of most of the fenceline in question. I reached for the binoculars I keep in the goodie bag on the buggy, then remembered I’d taken them out for safekeeping when I left the buggy for servicing overnight in Oatlands. Drat. Wind is howling, my feet are for all practical purposes bare, and I don’t have my phone. Now what? I considered and rejected a number of options, and finally decided I needed to do the job right, and drive up and over the top, and then down into the quarry where I could see the entire fence line. Hill daisies (brachyscome aculeata). I don’t have lots of these, so they always seem quite special to me when I come across them. And I found, caught in the fence in the one section I would not have been able to see with my binocs, a young wether. Still alive and kicking, thank goodness. I got him loose after a bit of a wrestle, when my boots would have been a better option for traction than flipflops, and he took off down the steep hill to the lower reaches of the Forest. I circled around to get into the Forest by the nearest gate. To my astonishment, the wether stopped running down the Forest track and stood to wait near the gate I intended to go through. Woolly new holland daisy (vittadinia gracilis). This threatened species is abundant on my dry, north-facing hillside near the quarry and Forest. This is the hillside I came down, on my side of the fence, with the wether on the other side. This wether is not a pet, but apparently our 18 months of shepherding has convinced him I’m on the side of the angels. In order for you to appreciate just how amazing the next bit is, I need to try to convey what happens in a conventional flock when a single sheep is isolated from his group. The fight-or-flight impulse redlines on the flight side, and most often you might as well walk away and wait a few hours for the sheep to calm down and make his way back to the flock. Even if he can see the flock, he won’t come to it right away—you have to move the flock to the single, and even then he may not rejoin. Singling is a complete pain, and cause for swearing at the dog who does it. 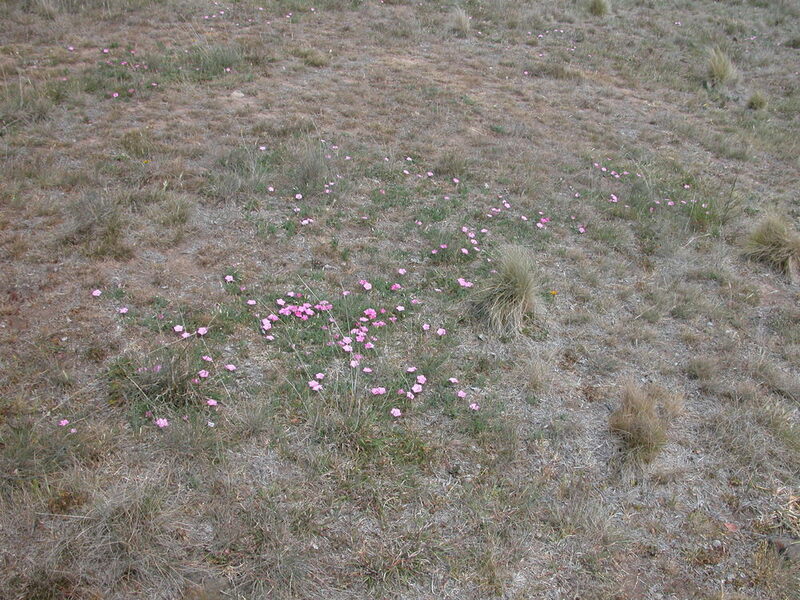 Pussytails (ptilotus spathulatus). Just what they sound like, darling little puffs of fluff on the dry ground. Here I had a single who’d been traumatised by 24 hours stuck in a fence, no flock anywhere in sight or smell, facing a human, a buggy and 2 dogs. The LAST thing I expected was for this young sheep to stop, wait for me to open two gates and then walk through toward me and the buggy with the dogs. I’m still shaking my head over this, which is why I knew I had to write about it. The flock was a kilometre or so away, through two more paddocks. Our hero walked steadily and calmly ahead of me and the buggy with the dogs in the back. He waited for me to open each gate, stopped for a drink and a couple of nibbles, then followed me (I was walking at this point) up to the final gate, which meant he had to walk on past the mob on the other side, who were not all the way to the gate. Then he calmly walked past me through the gateway as I held the gate open for him to go in and join his extended family. Another spread of convolvulus on the same hillside as the new holland daisies. The relationship between me and the individual sheep in my flock has reached a new level, one I talked more about in the Yarn “Epiphany”. They have learned almost everything they need to know about the landscape and forages in it and the layout of the property to be able to graze in circuits with minimal help from me. Their judgement about what to eat and how to find it is at least as good as mine, and I’ve realised it’s time for me to trust them in the same way I’ve been trying to get them to trust me. A new-found tiny orchid: Common golden moths (diuris chryseopsis) among wallaby grass in the Back Gully reserve. This little adventure with our hero wether illustrated, as no other single incident has, the extent to which individual sheep have learned to know and trust me. The reciprocity of this relationship staggers me. Common everlasting (chrysocephalum apiculatum)–inspiration for the WGW wool of the same name. And, to finish the story, my 2-minute excursion to the dog kennels lasted 2 hours, none of it in protective footgear or with my emergency phone, took me over half the property and through a personal transformation of major proportions. Common everlasting in the landscape, with wallaby grass, cutting sags (lomandra longifolia), and giving you some perspective on the state of the southern midlands hills. *For non-Aussies, “How long is a piece of string?” is used to imply the answer will be long and convoluted.